As with the Franz Josef Glacier, the Fox Glacier descends from the Southern Alps into temperate rainforest, making the West Coast glaciers the most unusual in the world. The Department of Conservation office at Fox Glacier provides up-to-date information about local tracks and track conditions. Visitors of average fitness can easily walk most tracks in the area. 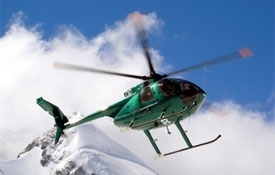 Guided glacier walks, heli-hikes, snow landings and other scenic flight options are available. Sights to see include Gillespies Beach, Lake Matheson (Aoraki Mount Cook and Tasman reflections) and the glowworm forest. Access to a seal colony at Gillespies Beach is available via the Galway Beach track. Food is available at a licensed café and bar in the village. 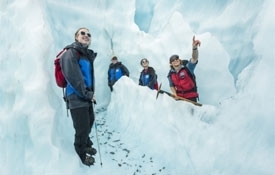 Enjoy a breathtaking guided trip on the West Coast's longest and less crowded glacier amidst fascinating ice formations with New Zealand's most experienced glacier guiding company. To ensure your safety, our guides are trained through the internationally recognised New Zealand Mountain Guides Association. We offer a full range of trips to suit all fitness levels and pride ourselves on offering exceptional customer service, the highest level of safety management and the best value for money trips. We are a small, private company offering value-based fares. 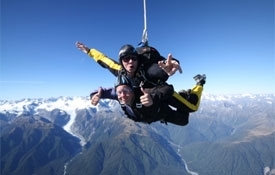 We fly from both Franz Josef and Fox Glaciers and our emphasis is on personal service catering to the needs of small groups, families and individuals. All window seats. Group discounts. Join us and experience the majestic beauty of Franz Josef and Fox Glaciers, a wonder of the world – Aoraki Mount Cook, and the Southern Alps. Reach out and feel this largely inaccessible alpine region. Hunting and fishing charters are also available. We have been voted 2nd most scenic skydive in the world (Everest came first), but we think we have the best dropzone in the world. Our leisurely flight to altitude takes us over the Fox Glacier (biggest of the West Coast glaciers) and up close and personal with Aoraki Mount Cook. We'll also give you a glimpse of the smaller Franz Josef Glacier, topped off with lakes, rainforests and the crashing Tasman Sea. This is truly the best scenery on offer in New Zealand. 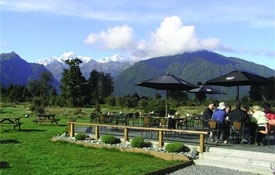 Award-winning café boasting unsurpassed views of Aoraki Mt Cook and Mt Tasman. 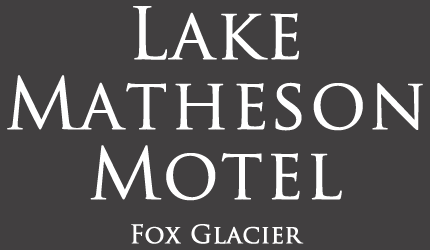 Matheson Café is a breakfast, lunch or dinner experience not to miss when visiting the glaciers. 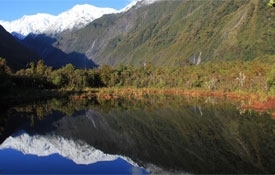 Located right by the entrance to the famous Lake Matheson walkway, just a short 6km drive from the Fox Glacier township. We pride ourselves on fresh and interesting food, making the most of seasonal ingredients, great coffee, quality service and a wonderful location. The park extends from the highest peaks of the Southern Alps/Ka Tiritiri o te Moana to the rugged and remote beaches of the wild West Coast. It is an area of magnificent primeval vistas – snow-capped mountains, glaciers, forests, tussock grasslands, lakes, rivers, wetlands and beaches. Extremely pleasant stay and motel. Fresh flowers a nice touch.